Special nutritional supplement, that satisfy body needs after intense physical effort. Supplement that delivers branched-chain amino acids (BCAA) in perfect 2:1:1 ratio. 2500 mg of leucine in every serving! Leuine, isoleuina and valine are three branched-chain amino acid form essential amino acids family, meaning that body cannot produce them and they must be delivered with food. Other essential amino acids are phenylalanine, methionine, tryptophan, threonine and lysine, but leucine, isoleucine and valine satisfy about 40% of body needs for essential amino acids. It is recommended to consume 40 mg per kg of body weight per day of leucine and 10-30 mg per kg of body weight per day of isoleucine and valine. To satisfy the needs of your body FA Engineered Nutrition® created new BCAA formula called Xtreme BCAA 5000. 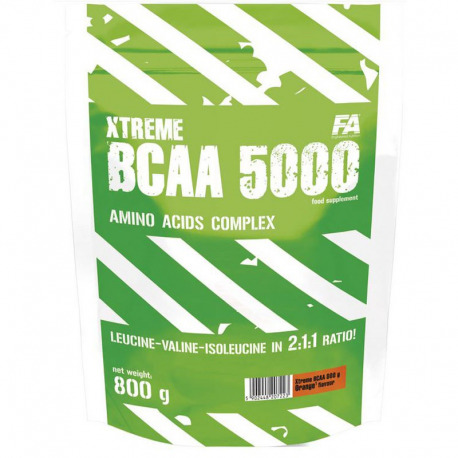 Xtreme BCAA 5000 is a new amino acid product in form of powder intended to prepare a drink containing 5 g of the highest quality branched- chain amino acids (BCAA – leucine, isoleuine and valine) in the perfect ratio 2:1:1. Branched-chain amino acids are crucial for muscle tissue during the workout, they increase anabolic activity, inhibit catabolism and serve as a fuel for working muscles. During the intense workout and to perform everyday activities as well, body uses ATP molecules as an energy source. ATP is produced in process called glucose oxidation. When glycogen storages in muscles are being used, ATP level also drops. After all of glycogen is used, body tries to support ATP level by BCAA degradation and breakdown of fatty acids. Depending on workout intensity, BAA can deliver 3 – 18% of energy. Because most of amino acids in the muscles are bonded, the amount of free amino acids, that can be used as a source of energy is very limited. BCAA stands for 35% of muscle mass and they are the main source of energy during prolonged and intensive physical effort. The longer and more intense the workout is, the more of leucine, isoleucine and valine is used. Leucine can be oxidized for energy or converted into glutamine and alanine, which can be used to produce glucose as an energy source in the bloodstream. Isoleucine and leucine can be converted with dehydrogenase into oxo-keto acids that can be later used in Krebs cycle, leading to ATP production. But BCAAs do not only inhibit catabolism. They also stimulate anabolism by increasing muscle protein synthesis. High level of leucine stimulates releasing of potent anabolic hormone insulin, which leads to increased BCAA absorption and decreasing muscle catabolism. Also, BCAA reduce lactic acid accumulation, which allows your body to efficiently regenerate after heavy workouts. Moreover, BCAAs inhibits tryptophan accumulation in nervous tissue, which is beneficial, because tryptophan increases level of serotonin, which is connected to fatigue level. With serotonin release inhibited, you can train longer without feeling fatigued. Bearing all that in mind, Xtreme BCAA 5000 supplementation, that delivers 5 g of free amino acids in every serving – amino acids that don’t need to be digested and are quickly absorbed and delivered to working muscles – inhibits muscle catabolism and support your goal of increasing lean muscle mass. Wide spectrum of Xtreme BCAA 5000 applications makes it perfect BCAA supplement for professional athletes and recreational trainers. Recommended use: Mix 1 scoop with 250 ml of water. Drink 1 serving 45-60 minutes before workout and another serving immediately after workout. Warnings: Do not use if you are allergic to any of product compounds. Do not use if pregnant or nursing. Store in dry and cool place. Protect from direct sunlight. INGREDIENTS: L-leucine, L-isoleucine, L-valine, acidity regulator (citric acid)1,2,3, flavouring1,2,3, sweetener (sucralose)1,2,3, colour (E1711, E160a2, E1043*). RECOMMENDED USE: Mix 2 scoops of powder with 200 ml of water, drink ½ serving before and ½ serving during training. WARNINGS: Contains sweetener. Do not use if you are allergic to any of the product compounds. Do not exceed the recommended daily dose. Food supplements should not be used as a substitute for a varied and well balanced diet. Do not use if pregnant or nursing. Keep out of reach of children. Store in dry and cool place. Protect from direct sunlight. FLAVOURS: Grapefruit1, Orange2, lemon & lime3.